Bounty Cruise is one of water activities in Bali that take us to Nusa Lembongan island which explore the beauty of this island. Bounty cruise give us a new experience by cruise to another part of Bali. This yacht capacity is about 600 people. Has three levels of decks make Bounty Cruise Bali is so magnificent. Bright yellow colors into the color characteristic of the Bounty Cruise Bali. The shape of this yacht made â€‹â€‹for ocean waves can penetrate Bali. With such a vast space, the passengers will be free to conduct all its activities in Bali Bounty Cruise. Bounty Cruise provides a variety of food during the journey to Nusa Lembongan island. Passengers are welcome to eat all of the dishes that have been provided. Exciting entertainment such as live Musis or dance performance will also entertain all the passengers. Under Deck also provides various types of drinks for anyone who wants to enjoy the cruise while drinking. Below decks also include air conditioning that makes us feel comfortable. To be sure, we will be very memorable holiday when the seas toward the tiny island of Nusa Lembongan with Bounty Cruise. Pick up between 8.00am until 8.30am directly from the hotel / villa where you stay in Bali (Kuta, Seminyak, Sanur, Jimbaran, Nusa Dua). It took approximately 30 minutes to reach harbor Benoa. Arriving in the harbor Benoa, Registration should be done for every passenger. Then we will welcome into the yacht. In the Bounty Cruise, all meals provided can begin to enjoy. During the trip to the island of Nusa Lembongan, various types of entertainment can be enjoyed such as live music, dance performances, and much more. We can also enjoy the atmosphere of sailing while sunbathing in the back of the yacht. Bounty Cruise would lean close to Nusa Lembongan Beach. In this place all the activity begins. 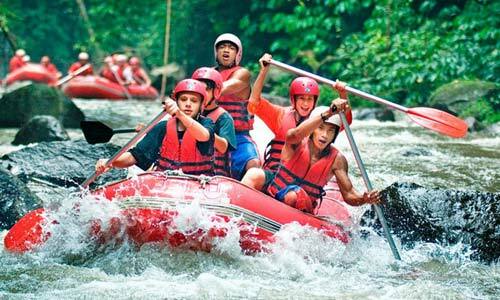 Banana boat, kayaking, 44 meters water slide, jumping and senorkling we can do here. Bounty Cruise also will invite all passengers visited places in the island of Nusa Lembongan as seen seaweed cultivation and see the underground house which is quite impressive.